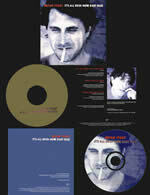 Lyrics to the song It's All Over Now Baby Blue as recorded by Bryan Ferry. Bryan Ferry recorded a version of Bob Dylan's It's All Over Now Baby Blue during the As Time Goes By tour and included it on album 'Frantic'. Bob Dylan recorded this song for his 1965 album 'Bringing It All Back Home.